Our Chef M.S.Rajmohan holds the Guinness World Records title for the attempt of Largest Bean Salad at the Vibrant Tamilnadu Global Food Expo by Tamilnadu Chamber Foundation in Madurai on 15.08.2018. 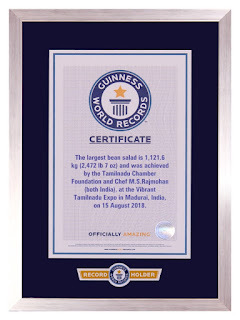 This bean salad was prepared with eight bean varieties and 31 other ingredients in a customized huge vessel; the final weight of the bean salad is 1121.6 kg. 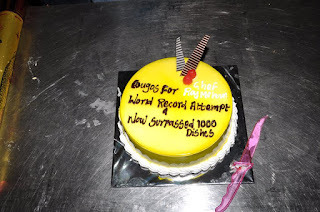 The team of 23 South India Chef's Association (SICA) chefs and 60 Young Chefs from various Hotel Management institutes was assisted to achieve this record breaking feat. This bean salad was attempted to create the awareness of healthy eating habits among public and to spread the importance of including beans in our diet. 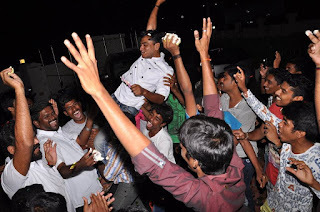 The bean salad was topped with Indian Tri color and finally this salad was distributed for general public consumption. 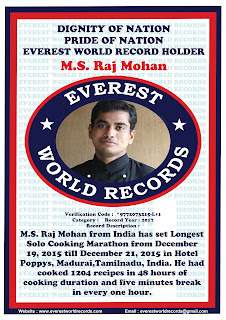 This attempt is also entered into Asia Book of Records and Limca Book of records. Dr.Chef.M.S.RajMohan is conferred the "Honoris Causa', an Honorary Doctorate Degree in Record Breaking from UK based World Records University for his outstanding contribution to the field of Culinary and Hotel Management Education. 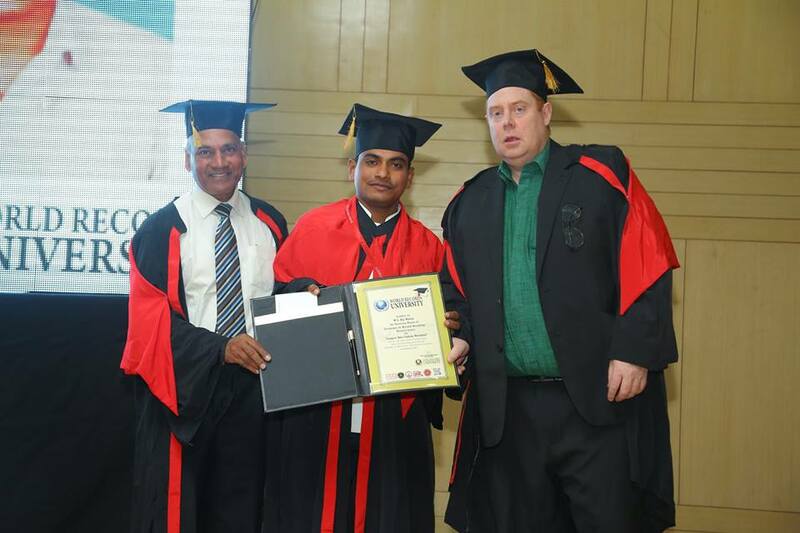 This degree is conferred upon him by Prof.Thomas Richard William Bains, Vice Chancellor of World Records University in a Convocation Ceremony held on 5th March, 2017 at Faridabad, India. 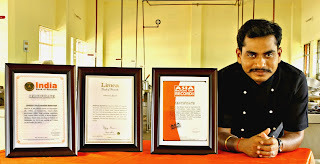 Chef M.S.Raj Mohan is entered into the Everest World Records for his achievement in "Longest Solo Cooking Marathon"
Chef M.S.Raj Mohan holding the Certificates of Limca Book of Records and Asia Book of Records for his achievement on "Longest Solo Cooking Marathon"
Chef M.S. 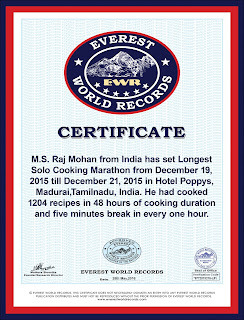 Raj Mohan has set a world record for the Longest Solo Cooking Marathon at Poppys Hotel in Madurai. 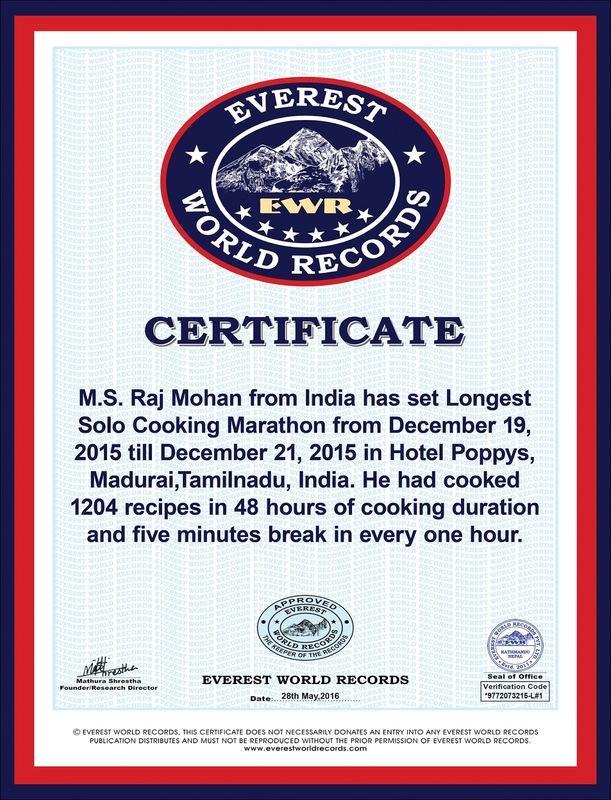 He started his world record on 19th December, 2015 at 7.10am and ended on 21st December, 2015 at 7.10am. 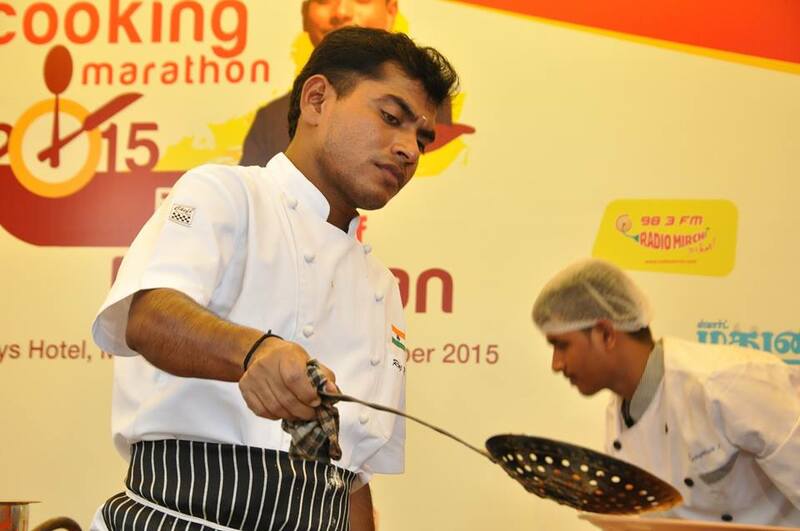 He cooked for 48 hours and dished out 1204 dishes in total which includes 947 vegetarian and 257 Non-vegetarian. The total weight of the prepared dishes was 307 kg. This record entered into Limca Book of Records, India Book of Records, Asia Book of Records and officially approved as world record by USA based prominent organisation RecordSetter. He is the first Indian chef who holds the world record title in Longest Individual cooking marathon in young age. This record event is adjudicated by a committee of 05 main and 24 sub-judges chosen by the Limca Book of Records and India Book of Records. 1. Grate the carrot. Heat ghee in a Kadai, add the grated carrot. Fry it nicely. 2. Pour the milk into it, boil the carrot in milk till it cooks. Once the carrot is almost ready and the milk is reduced, add the sugar. Mix it well. 3. Add the cardamom powder and Khoa. Stir it well. 4. Once the carrot absorbs the mixture, add the butter. Stir and take it out from fire. 5. Garnish with Ghee fried Cashewnuts & Raisins. 1. Sieve the gram flour and maida together. Mix refined oil and vanaspathi together. Keep the oil mixture over medium fire and heat it gently. 2. Keep the heavy bottomed kadai over medium flame, put the sugar and water in it. Dilute and boil till it reaches mild string consistency. 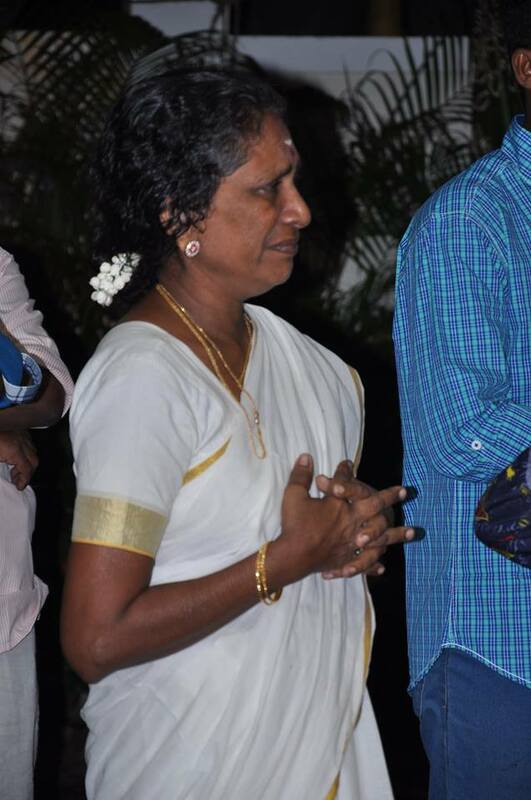 Gradually add the flour mixture in it and stir it fast but continuously with the help of thudupi / ladle. Ensure the mixture should be free from lumps. 3. Once the flour is added and it is mixed thoroughly with sugar syrup, pour all the hot oil gradually in the flour mixture. Stir it continuously & nicely. In a stage, the froth starts to appear that time add the melted ghee in it. Mix it well and take it out. Transfer the Mysorepak in a greased tray. Spread it evenly smooth. Cut it into pieces when it is warm. 1. Mix well the Gramflour, Rice flour, Vansapati, salt and soda salt. Add the onion, fennel, curry leaf, greenchilli, ginger & garlic paste. Mix all together now. 2. Sprinkle water and mix everything nicely. 3. Take the Pakoda mixture in hand and put the mixture in a sprinkled way into medium hot oil for deep frying. 4. Take out from oil once the pakoda is golden crispy fried. Drain it. 1. Steep the whole urid dal in water for about 20 minutes. Grind it in mixie by sprinkling little water as per need and prepare the soft batter as like how you prepare for the Medu vada batter. 2. Dilute both the colour powders in water. Add the corn flour and colour powder water in the jhangiri batter. Mix it well and beat it with your hands for about 5 minutes. 3. Heat the oil in Jhangiri kadai, Put the batter in Jhangir bag and squeeze (swirl) it in to the medium hot oil as the shape of Jhangiri. 4. Gently deep fry the Jhangiri. Once it is fried enough, take it out from oil and drop it in already prepared thin sugar syrup. Dip the Jhangiri for 2 minutes by using the ladle after that allow it for some minutes. 5. Take out the Jhangiri from sugar syrup when it is absorbed the juiciness of sugar syrup. 6. Garnish with coloured dessicated coconut / Cashewnuts slivers.